A number of studies in cognitive psychology and neuroscience have shown the effects of mindfulness and meditation training in enhancing cognitive functions assessed by a broad range of tasks implicating measures of response accuracy, response time, and associated electrophysiological and neuroimaging patterns (for reviews, see Cahn and Polich 2006; Chiesa et al. 2011; Gallant 2016; Lutz et al. 2008; Malinowski 2013; Tang et al. 2015). The set of cognitive functions found to be enhanced by mindfulness and meditation training includes centrally attentional processes (Malinowski 2013), such as attentional control, orienting, and alertness. These processes are in particular measured by the Attentional Network Test (ANT) (Fan et al. 2002) and its modifications (see Di Francesco et al. 2017), with some differential findings based on duration and type of meditation practice (e.g., Baijal et al. 2011; Jha et al. 2007; Tang et al. 2007; van den Hurk et al. 2009). Sustained attention tasks have also been used for cognitive performance assessment associated to mindfulness training (Jha et al. 2017; Lutz et al. 2009). Other tasks deal with the selective temporal deployment of attention through phenomena like attentional blink (Slagter et al. 2007). Remarkably, enhanced attentional processes and other functions were found with a brief mindfulness meditation training of 4 or 5 days (Tang et al. 2007; Zeidan et al. 2010). Other studies found effects of meditation on preattentive processes (e.g., Srinivasan and Baijal 2007). Several experimental findings also show the effects of mindfulness training on executive functions, which control and direct cognitive processes for working memory, planning, decision making, self-regulation, and many other goal-directed behaviors (Black et al. 2009; Gallant 2016; Teper et al. 2013), with particular reference to executive inhibition (Gallant 2016; see also Moore and Malinowski 2009). Such executive or cognitive control functions enhanced by mindfulness have been associated to the notion of cognitive flexibility (Kim et al. 2011; Miller and Cohen 2001; Moore and Malinowski 2009). Other studies found that mindfulness training enhances working memory processes, which plays a key role in higher cognitive functions (Mrazek et al. 2013; Quach et al. 2016; van Vugt and Jha 2011). Mindfulness meditation training has also been linked to the enhancement of creative thinking, such as in insight problem solving (Capurso et al. 2014; Greenberg et al. 2012; Ostafin and Kassman 2012). Colzato et al. (2017) emphasize the relevance of open monitoring meditation for divergent thinking, which can be associated with creativity. Other studies have found enhanced moral reasoning and ethical decision-making (Ruedy and Schweitzer 2011; Shapiro et al. 2012) and also an association between dispositional mindfulness and critical thinking (Noone et al. 2016). Mindfulness training has also been associated with an improved functioning of long-term memory, and in particular of retrieval processes (Heeren et al. 2009). In particular, mindfulness training has been found to lead to the increase of a characteristic of autobiographical memories known as specificity, i.e., to the degree to which individuals retrieve specific memories for personal experiences when asked to do so (Hargus et al. 2010; Heeren et al. 2009; Williams et al. 2000). Memory specificity is important given that a lack of specificity is often observed with depression and with a history of trauma and abuse (van Vreeswijk and de Wilde 2004; Williams et al. 2007). However, other studies found contrasting or puzzling evidence about the association of dispositional mindfulness or mindfulness training with improvements in episodic memory functioning (Crawley 2015; Rosenstreich 2016). One of the most influential theories of consciousness, with fundamental implications for addressing its neural correlates, is Global Workspace Theory (Baars 1988, 1997; Baars et al. 2003, 2013). This theory distinguishes between a limited capacity conscious processing, which through a global workspace (GW) is accessible to widespread information sources in the brain and unconscious processing, which involves information processing in a substantially segregated or modular fashion in the brain. The notion of GW is also central in the influential Global Neuronal Workspace model (Dehaene et al. 1998, 2006; Dehaene and Naccache 2001; Dehaene and Changeux 2011). This model emphasizes that the GW for consciousness can access perceptual input in different modalities as well as information in (explicit) long-term memory (e.g., during episodic retrieval), can perform evaluation of selected content and select consciously actions, and can direct attention in a top-down manner (Dehaene et al. 1998). Block (1995, 2005) incorporated the notion of GW in his influential distinction between phenomenal and access consciousness. Phenomenal consciousness refers to qualia, i.e., first-person experiences (see also Huxley 1874; Jackson 1982; Nagel 1974). Thus, phenomenally conscious content refers to subjective experience, such as in the perceptual experiences of red and green. Access consciousness involves content, which is “broadcast” in the GW and made available to the brain’s “consuming” systems, including systems for reasoning, planning, evaluation of alternatives, decision making, and control of attention. Remarkably, in Block’s view, phenomenal consciousness generally takes place without the involvement of top-down attention (see also Lamme 2003, 2010), unlike access consciousness and related GW processing. Based on earlier theoretical work (Raffone and Srinivasan 2009), we focus on GW processes involving Multiple Demand (MD) neurocognitive processors in a key network of frontal and parietal brain regions, which are important for a wide range of tasks (Duncan 2010, 2013) to address access consciousness as well as metacognitive consciousness and mindfulness, including the phenomenally related (direct experience of sensory and emotional contents) and the non-transitive aspects of mindful consciousness. These areas are thought to behave flexibly by adjusting to process the most important information at each moment and biasing processing elsewhere in the brain to drive a coherent goal-directed response across the system (Duncan 2010). The MD areas are involved in a common pattern of activity that is a salient part of the brain’s response to many different kinds of cognitive challenge or tasks. This MD pattern extends over a specific set of regions in prefrontal and parietal cortices, with a particular involvement of the region in and around the posterior part of the inferior frontal sulcus, in the pre-supplementary motor area and adjacent dorsal anterior cingulate, in the anterior insula and adjacent frontal operculum, in and around the intraparietal sulcus, and sometimes of a region in rostrolateral (anterior lateral) prefrontal cortex (Duncan 2010; Duncan and Owen 2000). The MD framework relates to the evidence that firing of a large population of adaptive coding neurons can be driven by different kinds of synaptic input sources which are widespread in the brain in a flexible task-dependent manner (Duncan 2001; see also Duncan and Miller 2002). It also relates to the proposal (Raffone and Srinivasan 2009) of an adaptive workspace framework for limited capacity conscious and meta-conscious processing based on recurrent interactions or dynamic links between adaptive coding (MD) neurons and widespread neurons in the brain. Several neuroscientific studies and related reviews (and meta-analyses) on meditation and mindfulness training highlight the key involvement of MD areas such as the dorsal anterior cingulate cortex (e.g., Cahn and Polich 2006; Fox et al. 2014; Manna et al. 2010; Tang et al. 2015), anterior insula (e.g., Fox et al. 2014; Lazar et al. 2005; Tang et al. 2015), intraparietal sulcus (e.g., Brefczynski-Lewis et al. 2007; Kurth et al. 2015; Lutz et al. 2008), and rostrolateral prefrontal cortex (e.g., Fox et al. 2014; Lazar et al. 2005). Neuroscientific findings (e.g., Luders et al. 2011; Tang et al. 2010; see also the meta-analysis of Fox et al. 2014) also highlight the involvement of intra- and inter-hemispheric communication pathways in meditation, which are also implicated in GW processes for conscious access (Dehaene et al. 1998; Raffone et al. 2014). Taken together, these findings appear to support the adaptive workspace framework with flexible GW processes involving MD areas in understanding meditation and mindfulness training. The MD brain regions reviewed above also appear to overlap substantially with the central executive network and the salience network having a key role in a range of cognitive functions and tasks (for a review, see Bressler and Menon 2010) as well as in multiple psychopathology conditions (for a review, see Menon 2011). They are also characterized by their high sensitivity to mindfulness meditation training (for a review, see Malinowski 2013). Furthermore, electroencephalographic (EEG) and magnetoencephalographic (MEG) investigations suggest the importance of large-scale coherent oscillatory patterns in the brain in meditation (e.g., Hauswald et al. 2015; Lutz et al. 2004; Marzetti et al. 2014; Murata et al. 2004). These patterns can plausibly support reversible recurrent interactions or dynamic links between MD neurons and widespread neurons in the brain that could underlie flexible GW processes associated to meditation and mindfulness. “Present moment meta-awareness” or mindfulness of contents in the fields of experience in the present moment can thus be correlated with recurrent interactions or dynamic links between MD neurons in the GW, and between these and widely distributed neurons acting as neural (somatic) markers of transient (momentary) body states, in particular, right lateralized exteroceptive somatic and interoceptive insular cortices (Craig 2004; Critchley et al. 2004; Damasio 1999). Such mindful awareness and the related neural processes above can also occur in a non-transitive form (without an explicit single object of awareness) as associated with open monitoring (Lutz et al. 2008; Raffone and Srinivasan 2010), automatic self-transcending (Travis and Shear 2010), and non-dual awareness (Josipovic 2012) forms of meditation (see also Raffone and Srinivasan 2009). Importantly, unlike in the phenomenal consciousness view of Block (1995, 2005, 2007) and related neuroscientific views (Lamme 2003, 2010; see Raffone and Pantani 2010 for a different perspective), the phenomenology (first-person observation) and (third-person) neuroscientific investigations of meditation (and mindfulness meditation in particular) show that attention is indeed highly associated to the phenomenal awareness of the meditation object or multiple transient contents in the fields of experience (e.g., Lutz et al. 2008; Raffone and Srinivasan 2009; see also Norman 2017). Moreover, in meditation, the neurocognitive “consuming” systems (e.g., systems for reasoning, planning, action selection, judgment, decision making) in the operation of the GW for conscious access, associated with deliberate thinking and action, are generally de-emphasized, with an attenuated involvement. Thus, conscious access to the meditation object (e.g., breath-related input) in focused attention meditation or (transiently) to multiple objects in the fields of experience in open monitoring meditation is plausibly associated to a reduced broadcasting to neurons involved in task-related thinking processes and action selection in conscious access in the GW. The non-judgmental aspect of mindfulness (e.g., Kabat-Zinn 1990) can indeed arise from such flexibility of attention-based conscious access to momentary contents (in the GW) without a mandatory broadcasting for thinking and acting in mindfulness meditation. Moreover, the adaptive workspace framework predicts that in meditation, the sustained cognitive focus on a simple object (or the “choiceless” unsustained focus in open monitoring meditation), together with the absence of a mandatory association of MD neurons with the consuming systems for conscious thinking and action, induces the disposition for such MD neurons to more flexibly engage (or disengage) in and across a wide range of cognitive tasks involving attention, cognitive control, working memory, or fluid intelligence (see Duncan 2010). For example, reduced attentional blink with intensive (insight) meditation training (Slagter et al. 2007) can be explained in terms of such flexibility and reversibility of conscious executive processing of sequential targets, preventing a mandatory over-investment of executive resources on the first target in a visually rapidly presented stream. The P3b event-related potential component related to reduced attentional blink with intensive meditation practice can indeed be associated with GW processes for conscious processing (Raffone et al. 2014). GW processes have also been associated with the Stroop task (Dehaene et al. 1998), which measures an aspect of cognitive flexibility enhanced by mindfulness training (Moore and Malinowski 2009). More generally, the adaptive workspace framework suggests that a cognitive (or neurocognitive) meta-flexibility supports the function of mindful awareness within and without meditation practice. Such meta-flexibility is in turn enhanced by meditation practice with the implication of both functional and structural neuroplasticity (e.g., Lutz et al. 2008; Tang et al. 2015). In other words, mental training in mindfulness meditation can be plausibly associated with the enhancement of flexibility of the neurocognitive operations involving MD neurons in the GW for conscious access and control of attention within a given task. It can furthermore be related with the neurocognitive meta-flexibility to allocate MD neurons to a wide range of cognitive tasks including monitoring, control, working memory, and fluid intelligence. Finally, this meta-flexibility and its putative neural basis can be associated with the evidence that more mindful individuals are oriented in the present, open to novelty, sensitive to changes in context, and aware of multiple perspectives (Langer and Moldoveanu 2000; Sternberg 2000). As suggested by Zylberberg et al. (2011; see also Barendregt and Raffone 2013; Dehaene and Sigman 2012; Duncan 2010, 2013; Raffone et al. 2014), central executive (and related salience network) brain areas associated to the GW are involved in mental programs. These mental programs integrate serial discrete operations with massively parallel distributed processing in the brain, in a (hybrid) brain Turing machine for cognitive focus and sequential cognitive operations. As also argued above, the flexible implication of the GW for attention-based conscious processing and cognitive control in mindfulness meditation can plausibly create the conditions for more flexible mental programs in a range of cognitive tasks, together with a more general ability (cognitive meta-flexibility) to enhance processing efficiency (as reflected in both response accuracy and time) and cognitive monitoring across multiple tasks in which attention, cognitive control, and performance monitoring play a crucial role. It appears remarkable that such flexibility and meta-flexibility of mental programming can be achieved with the sustained practice (within and between meditation sessions) based on simple meditation instructions and a minimal involvement of thought contents. The mental program for focused attention meditation includes the following processing steps (Hasenkamp et al. 2012; Lutz et al. 2008): (1) detection of distraction from the meditation object, without judgment and further mind wandering; (2) refocusing attention and conscious access on the meditation object; and (3) sustaining focus on this object. During meditation, a cyclic reiteration of these processing steps takes place. The neuroimaging study of Hasenkamp et al. (2012) has shown the key involvement of areas of the central executive and salience networks related to mindfulness and control of attention during meditation, consistent with the adaptive workspace framework. The mental program in meditation thus emphasizes the timely performance of the mental processing steps above, without an executive commitment to represent and process actively contents or objects of perception, thought, and action, together with a more fundamental monitoring function associated to mindfulness. This monitoring function is emphasized even more in open monitoring meditation (Lutz et al. 2008; see also Colzato et al. 2017), together with distributed attention (Srinivasan et al. 2009) and the processing steps of rapid conscious access to momentary contents of experience and rapid disengagement from any arising thought associations. Remarkably, the time-honored practice of meditation suggests that in order to enhance the abilities to think flexibly and of cognitive focus on the task at hand, one has to learn to detach from mandatory thinking such as in spontaneous mind wandering and judgments, which can be both task-related and task-unrelated (Smallwood et al. 2009). The adaptive workspace framework proposes a neurocognitive account related to such suggestion (see also Pagnoni et al. 2008). Finally, the adaptive workspace framework suggests that mindfulness meditation leads to the flexibility to shift or reset the focus of attention and thought, in particular when such focus is dysfunctional, such as in the unwholesome mentation associated with rumination in depression (e.g., Ietsugu et al. 2015), obsessive thinking in obsessive-compulsive disorder (e.g., Singh et al. 2004), and to craving-related thoughts in addictions (e.g., Garland et al. 2014). Indeed, theories of consciousness and attention (Dehaene et al. 2006; Raffone et al. 2014; Simione et al. 2012) highlight the interdependence or co-determination of attentional focus and conscious (cognitive) access, which can give rise to closed or repetitive loops in thinking, such as in mind wandering (Smallwood and Schooler 2015), and inattentional blindness in perceptual processing (Mack and Rock 1998). Several neuroscientific studies show the effects of mindfulness meditation on self-reference and the associated default mode network in the brain (e.g., Berkovich-Ohana et al. 2013; Farb et al. 2007; Marzetti et al. 2014; for related theoretical views, see Tagini and Raffone 2010; Vago and Silbersweig 2012; see also Berkovich-Ohana and Glicksohn 2017). Such findings are consistent with an increased flexibility in self-reference. The adaptive workspace approach highlights the role of MD areas and their role in interaction with the default mode network for such flexibility (see also Raffone et al. 2010). The adaptive workspace framework can also account for the reduced emotional reactivity with mindfulness training (Britton et al. 2012; van den Hurk et al. 2009; Farb et al. 2010). Indeed, MD areas, and in particular those in the salience network, are also implicated in emotion, feeling associated to different mental states and emotional regulation (e.g., Craig 2004, 2009; Critchley et al. 2004; Damasio 1999). This reduced emotional reactivity effect with mindfulness training can plausibly involve interactions between the MD activity pattern and the orbitofrontal cortex, with a key role in emotion states and emotion regulation in interaction with the amygdala (Salzman and Fusi 2010). Indeed, as suggested by LeDoux (2000, 2012), the cognitive workspace for conscious access (associated to the notion of GW) is also involved in conscious feelings and emotions. This workspace integrates signals about survival circuit activity (in particular from the amygdala), environmental stimuli (through different sensory modalities), language (and related concepts), explicit memory (from semantic and episodic memory), central nervous system (CNS) arousal, and body feedback. The enhanced adaptivity of the GW in terms of neurocognitive flexibility and meta-flexibility with mindfulness meditation training, associated in particular to the involvement of MD areas, would also plausibly implicate a reduced emotional reactivity to a range of stimuli, and in particular to those characterized by a high arousal (activation), and with different mental states (e.g., sadness, anger, euphoria) associated in particular to interactions between orbitofrontal cortex and the amygdala (Salzman and Fusi 2010), as well as to the salience network (Allman et al. 2001; Craig 2009). Furthermore, differential adaptive links with different neuronal sources of input to the GW (cognitive workspace, LeDoux 2000, 2012), such as survival circuit activity (and the amygdala in particular), environmental stimuli, language, and body feedback, can be associated to different facets of mindfulness (Baer et al. 2004, 2006). For example, it can be hypothesized that in the widely used Five Facets Mindfulness Questionnaire (FFMQ) developed by Baer et al. (2006; see also Di Francesco et al. 2017), the mindfulness facet observe (or notice sensations, perceptions, thoughts, and feelings in the present moment) is associated to a generalized efficiency of adaptive workspace links with multiple sources of input to the GW and MD areas in particular. The facet acting with awareness is associated with particularly efficient dynamic links with the anterior cingulate cortex (Allman et al. 2001; Manna et al. 2010; Tang et al. 2015) and dorsolateral prefrontal cortex (Cahn and Polich 2006; Dehaene et al. 1998; Duncan 2010). The facet describe (or label with words emotional or affective experiences in the present moment) is associated with particularly efficient links of the GW with language-related areas in the left hemisphere. The facet non-judging of internal experience in the present moment is associated with a relative decoupling of the GW from evaluation-related areas in ventromedial prefrontal cortex and enhanced links with MD areas and dorsolateral prefrontal cortex (see also Farb et al. 2007). Finally, the facet non-reactivity to inner experience is associated with a less reactive coupling of survival circuit areas (and in particular of the amygdala) and CNS arousal centers with the adaptive GW. Further functional connectivity studies involving in particular functional magnetic resonance imaging (fMRI) and MEG will be needed to assess such hypotheses. Finally, the adaptive workspace framework enables a synthetic conceptualization of mindfulness both in unitary terms, in reference to the integrated GW (or MD activity pattern), and in terms of multiple facets, in reference to the differential involvement of brain systems and adaptive links in such GW processing (or MD activity pattern). The articles contributed for the special section of Mindfulness on “Mindfulness and cognition” cover a range of domains of human cognition and related functions such as consciousness and self. The mental functions addressed by these articles include perception (Pagnoni and Guareschi 2017; Srinivasan and Singh 2017), multiple attentional processes (Di Francesco et al. 2017; Ben-Soussan et al. 2017; Jha et al. 2017; Malinowski et al. 2017; Srinivasan and Singh 2017; van Vugt and van den Hurk 2017), including attentional control, attentional orienting, alertness, sustained attention, attentional effort, and scope of attention, cognitive control (Malinowski et al. 2017), thinking processes (Colzato et al. 2017), metacognition (Norman 2017), consciousness (Ben-Soussan et al. 2017; Norman 2017; Pagnoni and Guareschi 2017; Srinivasan and Singh 2017), and self (Berkovich-Ohana and Glicksohn 2017). Neurocognitive aging (Malinowski et al. 2017) as well as affective processing (Malinowski et al. 2017; Berkovich-Ohana and Glicksohn 2017) and transcendence experiences (Berkovich-Ohana and Glicksohn 2017; Pagnoni and Guareschi 2017) are also addressed in the special section. The research methods used across the empirical investigations in the contributed articles include behavioral paradigms (Colzato et al. 2017; Di Francesco et al. 2017; Jha et al. 2017; Malinowski et al. 2017; van Vugt and van den Hurk 2017), psychophysics (Srinivasan and Singh 2017), electroencephalography (Malinowski et al. 2017), phenomenological reports (Ben-Soussan et al. 2017; Berkovich-Ohana and Glicksohn 2017), computational modeling (van Vugt and van den Hurk 2017), and dispositional self-report measures (Berkovich-Ohana and Glicksohn 2017; Di Francesco et al. 2017). Jha et al. (2017) integrate behavioral measures (with the SART task) with subjective reports in a study about the effects of mindfulness training on attention and mind wandering. Other contributed articles emphasize theoretical reflection informed by phenomenology, neurosciences, and contemplative tradition (Norman 2017; Pagnoni and Guareschi 2017). The empirical investigations involve mindfulness or meditation training on the timescale of several weeks (e.g., Ben-Soussan et al. 2017; Jha et al. 2017; Malinowski et al. 2017) as well as long-term meditators (e.g., Srinivasan and Singh 2017) and assessment of dispositional mindfulness in non-meditators (Di Francesco et al. 2017). Colzato et al. (2017) contrast the effects of focused attention meditation and open monitoring meditation on thinking processes. Pagnoni and Guareschi (2017) present an original dialogue between a neuroscientist and a contemplative (Zen Buddhist) teacher, with a particular focus on the influential predictive coding framework (Friston 2009). The findings in the contributed articles have relevant implications for mindfulness research and applications. For example, the results of Jha et al. (2017) suggest that mindfulness training may help alleviate some of the harmful effects of stress and promote cognitive resilience. The study of Di Francesco et al. (2017) has implications for the assessment of mindfulness and its effects in terms of both self-report dispositional measures and behavioral tests. The work of Malinowski et al. shows the potential of mindfulness training in an elderly people with focus on important cognitive control and emotion regulation functions, and their electrophysiological correlates which can be associated with neuroplasticity. The findings of Srinivasan and Singh (2017) and of Berkovich-Ohana and Glicksohn (2017) show the impact of meditation training on different aspects of awareness and related functions. The articles by van Vugt and van den Hurk (2017) and of Malinowski et al. (2017) also contribute to the understanding of the attentional and cognitive control mechanisms associated with mindfulness meditation training. The articles by Berkovich-Ohana and Glicksohn (2017), Norman (2017), and of Pagnoni and Guareschi (2017), together with the current article, integrate the study of meditation and mindfulness within broader areas of theoretical research on consciousness, cognition, self, and the mind-brain relationship. 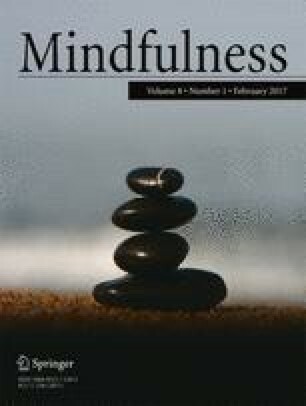 To conclude, the findings reviewed and the theoretical framework proposed in this article, together with the articles contributed in this special section of Mindfulness on “Mindfulness and cognition,” highlight the different facets of the impact of mindfulness and meditation training on cognition, consciousness, self, and affective processing. The articles in this special section together emphasize the importance to bridge experimental studies with phenomenological and theoretical insights. Finally, they also point to further research questions about the effects of mindfulness and meditation to be addressed in experimental psychology, cognitive, affective, social, and consciousness neurosciences, as well as in phenomenological investigations and psychology of personality. A.R. was supported by a grant from the BIAL Foundation (Portugal) on the project “Aware Mind-Brain: bridging insights on the mechanisms and neural substrates of human awareness and meditation.” N.S. was supported by a research grant (SR/CSI/27/2010) from the Department of Science and Technology, India. Ben-Soussan, T. D., Glicksohn, J., & Berkovich-Ohana, A. (2017). Attentional effort, mindfulness, and altered states of consciousness experiences following quadrato motor training. Mindfulness, 8. doi: 10.1007/s12671-015-0469-5. Berkovich-Ohana A., & Glicksohn J. (2017). Meditation, absorption, transcendent experience, and affect: tying it all together via the consciousness state space (CSS) model. Mindfulness, 8. doi: 10.1007/s12671-015-0481-9. Colzato, L. S., Szapora, A., Lippelt, D., & Hommel, B. (2017). Prior meditation practice modulates performance and strategy use in convergent- and divergent-thinking problems. Mindfulness, 8. doi: 10.1007/s12671-014-0352-9. Di Francesco, S. A., Luca Simione, L., López-Ramón, M. F., Belardinelli, M. O., Lupiáñez, J., & Raffone, A. (2017). Dispositional mindfulness facets predict the efficiency of attentional net works. Mindfulness, 8. doi: 10.1007/s12671-016-0634-5. Jha, A. P., Morrison, A. B., Parker, S. C., & Stanley, E. A. (2017). Practice is protective: mindfulness training promotes cognitive resilience in high-stress cohorts. Mindfulness, 8. doi: 10.1007/s12671-015-0465-9. Malinowski, P., Moore, A. W., Mead, B. R., & Gruber, T. (2017). Mindful aging: the effects of regular brief mindfulness practice on electrophysiological markers of cognitive and affective progressing in older adults. Mindfulness, 8. doi: 10.1007/s12671-015-0482-8. Norman, E. (2017). Metacognition and mindfulness: the role of fringe consciousness. Mindfulness, 8. doi: 10.1007/s12671-016-0494-z. Pagnoni, G., & Guareschi, F. T. (2017). Remembrance of things to come: a conversation between Zen and neuroscience on the predictive nature of the mind. Mindfulness, 8. doi: 10.1007/s12671-015-0438-z. Srinivasan, N., & Singh, A. (2017). Concentrative meditation influences visual awareness: a study with color afterimages. Mindfulness, 8. doi: 10.1007/s12671-015-0428-1. Van Vugt, M. K., & van den Hurk, P. M. (2017). Modeling the effects of attentional cueing on meditators. Mindfulness, 8. doi: 10.1007/s12671-015-0464-x.